It is officially Fall. I don’t know if its a New England thing, but, as soon as the calendar hits September 1st it’s time to pull out your fall staples. We start wanting to pull out the sweaters, scarfs, and boots. The problem is if you live where I do, it is still 80 degrees some days. We aren’t going to let that stop us. Right now its all about transitioning over to fall. Everyone is eager to start wearing their favorite fall pieces, and its possible even on the warmer days. These few simple tips will help you look fall-ish in your favorite fall staples even when its 80 mid September! Pull out your fall favorites, its time. Instead of dressing head to toe in your pieces, choose one. For instance, this look I created incorporated the OTK (over the knee) boot that i picked up at the #Nsale. I wore it with a simple denim skirt, and my all time Favorite tee. If you purchase one thing from this post, these lush tee shirts are amazing. This one is also on major sale right now!! Whether a great fall staple, or my favorite accessory its time to start dressing the part for fall. Start bringing out the fall colors. Even if your clothes are still light and airy, start choosing seasonable colors. This fall, mauves, burgundy, shades of blue, warm taupes and grays are huge. In this post I am wearing a tee in a great fall color. Its a great basic and can pretty much be styled anyway. Fall fabric is great too! Whether a wool hat, suede skirt, or velvet choker which can be the perfect transitioning piece. Fall is with a doubt, one of my favorite seasons to dress for. This outfit is simple and versatile. This denim skirt was super affordable at Forever 21. When the weather drops I can add a cardigan or bomber jacket. 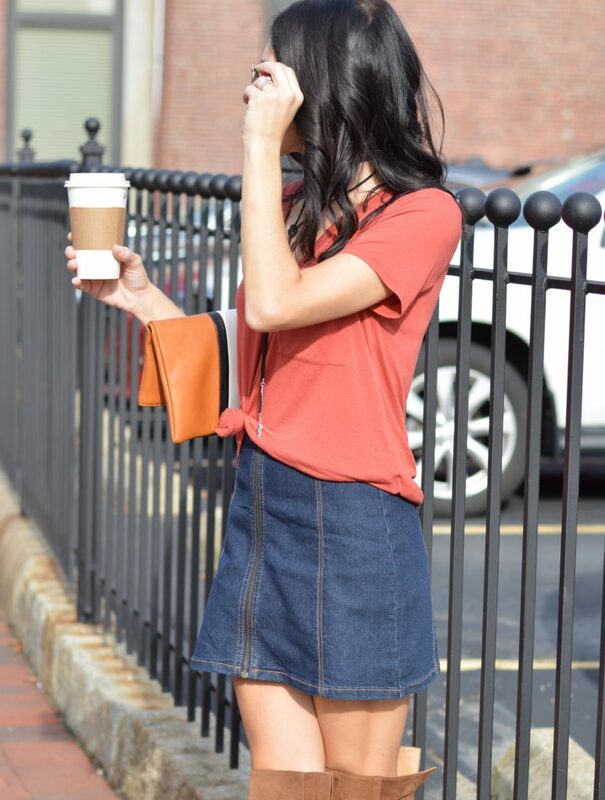 A denim skirt like this can transition into fall easy when paired with high boots. I was unsure if I would ever wear a denim skirt again, after the whole frayed denim mini skirt with Ugg boot epidemic! That was awful…….comment below if u know what I’m talking about, or was it just a Boston thing?